There are a number of ways we demonstrate our commitment to delivering high-quality early intervention and support for children with autism. AEIOU prioritises research and assessment, both internally and through external partnerships. The Research and Assessment Department was established at AEIOU in response to a growing need to demonstrate research outcomes of the program and to meet the Australian Good Practice Guidelines (Roberts & Prior, 2012). This department recognises the integral relationship between research and practice as a foundation for Evidence-Based Practice and being quality and research focussed, strategic enablers at AEIOU. Research at AEIOU focuses on monitoring and assessing the outcomes of the AEIOU program as well as determining the factors that predict response to treatment and the impact ASD has not only on children but on families. This research will provide an evidence-base for AEIOU and will help us to better understand and meet the needs of children and families attending AEIOU, as well as providing world-class information on ASD which will be of benefit internationally. Benefit will be achieved through active promotion of AEIOU research via conferences, seminars, publications, and media opportunities. High quality assessment is vital to both providing Good Practice (Roberts & Prior, 2012) Early Intervention, and to conducting high quality research. 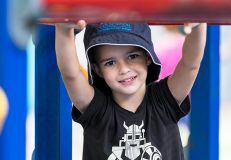 Assessment of children and families yields invaluable information about the strengths and needs of children with autism, and is essential for individualising programs for optimal outcomes for each child and their family. 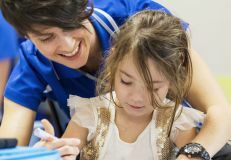 Assessment is also the foundation of all research and provides the information to develop a database of children for both program evaluation and longitudinal research. Assess and review research proposals from external individuals or institutions. Coordinate research activities to ensure children and their families are supported when participating in research and are not excessively burdened by research activity. Ensure that constructive relationships pertaining to research are maintained between families of children with autistic spectrum disorder, researchers, AEIOU staff and the AEIOU Foundation and promptly address any concerns that arise. Make recommendations to the AEIOU Board supporting or opposing research projects. (Decisions will be made on (a) the safety and welfare of children and families attending AEIOU and (b) scientific validity). In addition to the Autism and Research Innovation Committee, AEIOU Foundation is a key funding partner of the Autism Cooperative Research Centre, the world’s first national cooperative research effort focussed on Autism, which takes a whole-of-life approach to Autism Spectrum Disorder, from focussing on diagnosis, education and adult life. If you have an interest in research, and would like to know more about the AEIOU Research and Innovation Committee, please email Dr Madonna Tucker. To read an overview of the team, view our flyer. To propose a research project, or advertise for participants in a study you're currently conducting, please download and submit this form. Once received, the proposal will be discussed with the AEIOU Research and Innovation Committee at its monthly meeting. To read published research articles or economic reports created or commissioned by AEIOU Foundation click here.